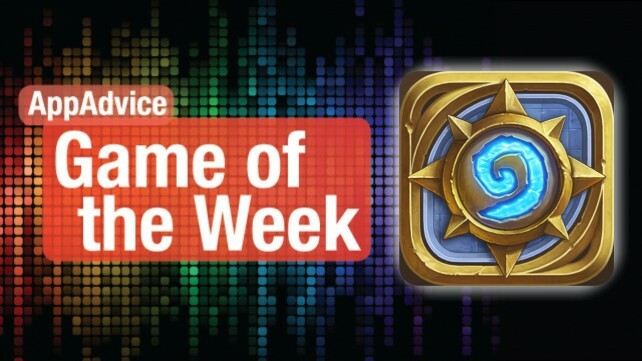 Face off against challenging card duels in the world of Warcraft with our Game of the Week. Have the itch for World of Warcraft and collectible card games? Then our Game of the Week should sate your needs. 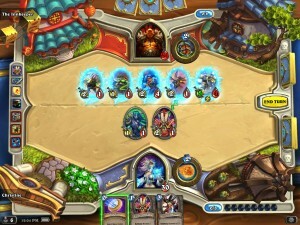 Say hello to Hearthstone: Heroes of Warcraft for your iPad. This engrossing card game brings the world of Warcraft to you, but in card game form. The visuals are rich and detailed, featuring fantastic card art, character portraits, and even pop-up like elements on the virtual tabletop that you may recognize if you’ve ever played World of Warcraft. And the adventurous soundtrack will keep you wanting more as you feel right at home. Hearthstone uses Blizzard’s Battle.net service, so players just log in or sign up for a free account, and their progress will be saved on their servers. You can seamlessly switch between different iPads and even with your PC or Mac. The game will start new players off with a tutorial of six different battles, and each one will introduce a new gameplay mechanic. Once you get past the tutorial, you’ll be able to go into Practice to unlock new classes, or go into Play to battle random opponents of your skill level, and you can even challenge your friends to a duel. In Hearthstone, players are able to unlock a total of eight characters by beating them in Practice Mode you start out with the Mage. The eight other classes are Warrior, Shaman, Rogue, Paladin, Hunter, Druid, Warlock, and Priest. Each class will have their own unique set of cards that only they can use, and you can earn and collect these by constantly playing with that class. The heroes will also have unique abilities that can be used during the game, though at the cost of mana crystals, which are used to summon minions and cast spells. However, unlike other card games, Hearthstone is much more streamlined, since you automatically gain a mana crystal each turn, so you don’t need to depend on luck for mana in your first hand. The more you play, level up your character, and complete quests, the more cards you earn. You can even earn booster packs that can contain a random card, so make sure to keep playing! While you can buy packs of cards through IAPs, Blizzard makes it possible to earn all cards just by continuously playing the game no money is required. That is, unless you want to participate in the competitive Arena, which will require a fee to enter. We’ve been thoroughly enjoying Hearthstone on our iPads since it’s US release last week, and it’s one of our current favorite games. If you enjoy Warcraft and card games, then definitely check this out. Get it for your iPad on the App Store for free. 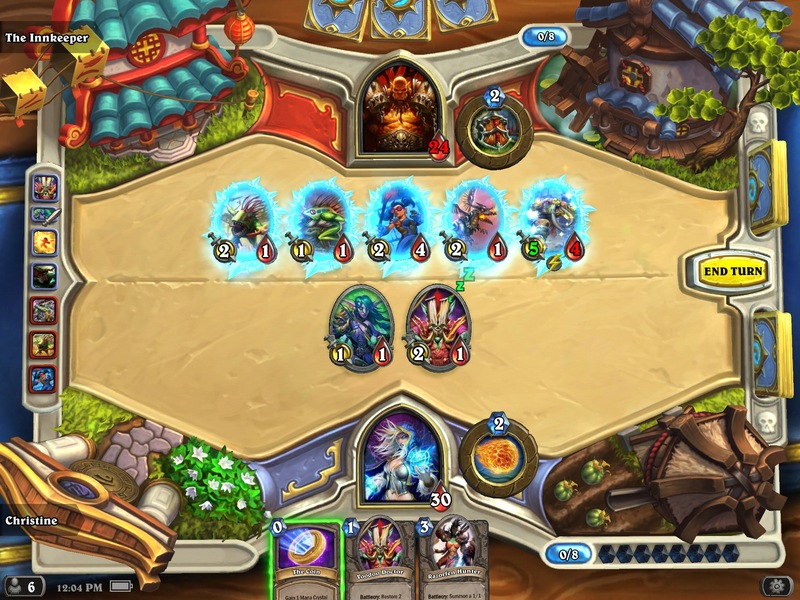 For more information on Hearthstone: Heroes of Warcraft, make sure to check out my full review. This twitch reflex game will make you feel as if you’re really flying through the skies. In the mood for a twitch reflex arcade game instead? Then you can’t miss out on our Honorable Mention, Unpossible. 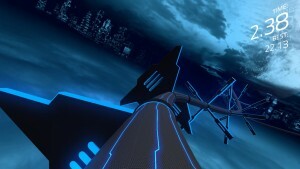 This sleek twitch game resembles the digital world of TRON, and it will have you feeling as if you’re really flying through the skies as you gain momentum. The visuals in the game are beautiful and rendered fantastically in 3-D, making it feel like you’re really there. The soundtrack is also nice, and should be a nice treat for fans of the electronic genre. The game has three main game modes: Simplicity, Futile, and Ultra. There is also the endless Cruise mode, and a Daily version of each mode that features a single level each day for you to practice and earn the best time on. You start out with Simplicity, which is basically an introduction to the game. Once you last at least 60 seconds in it, you’ll unlock Futile, where things pick up in speed. If you can last 60 seconds in that, you will unlock Ultra, the mode that isn’t for the faint of heart. Each game will last until you crash into an obstacle, and your score is just how long you managed to survive in that run. Controls are simple and really get out of the way once enabled. You can choose to go with tilt controls (adjust sensitivity to your preference) or touch. I personally prefer touch, and it’s very responsive, so there’s no lag between your input and the action, which is just what you need in a twitch game. We have been absolutely loving Unpossible over the past week, as it’s a great little pick-up-and-play game that is simple to learn but difficult to master. If you’re in the mood for a twitch reflex arcade game this week, then don’t hesitate to pick this one up. You can find it on the App Store as a universal download for $1.99. For more on Unpossible, don’t miss my original review.